This graceful shrub has upright stems that arch outwards with age. Large deep golden flowers bloom in spring and summer. Hypericum 'Rowallane' is a hybrid between Hypericum leschenaultii (native to Indonesia) and H. hookerianum 'Charles Rogers.' The shrub was named for the garden in which it was discovered. Rowallane Garden is a renowned garden, owned by the National Trust, in County Down south of Belfast in Northern Ireland. It was created in the first half of the 20th Century by Hugh Armytage Moore who subscribed to various plant-hunting expeditions. Discoveries from these expeditions were nurtured in the garden and several shrubs and perennials have been named for the garden. 'Rowallane' is a graceful shrub with long upright stems that gradually arch outwards, producing a V-shaped profile. Large, deep golden yellow flowers with prominent stamens (one of the hallmarks of all hypericums) develop at the ends of drooping branchlets in late spring and summer. 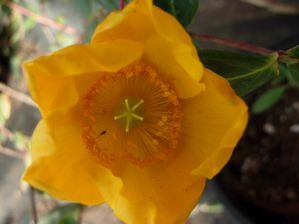 In coastal climates, you can plant Rowallane hypericum in full sun or shade. In hotter inland areas, plant it in partial to full shade. Rowallane hypericum's tolerant of most soil types including clay. Once established, Rowallane hypericum's water needs in the dry summer months are fairly low. At the nursery in Soquel, it hasn't looked very happy without any summer water, but has survived. In coastal areas, a deep watering once a month in the summer should be sufficient to keep the shrub looking good. Rowallane doesn't seem to be prone to any pests or diseases. Aphids may sometimes be found on young, sappy new growth but they can easily be washed off. Alternatively, cut off the affected growth and throw it away. Bees are attracted to the flowers. This shrub needs very little maintenance; just an occasional pruning if needed to shape the plant.